I didn't get as many pictures of our Christmas morning due to Brody wanting to nurse right during all the excitement. We had a wonderful Christmas. I love waiting for my kids to wake up in the morning. I lay in bed so anxious for them to wake up. This year I didn't have to wait long. Tommy woke up at 6:45am. That is the earliest my kids have waken up. I didn't mind though because Brody woke me up at 5:30am and I was so excited I couldn't get back to sleep. I hear Tommy trying to wake Blake up. "Blake, it's Christmas WAKE UP. Blake it's Christmas!!! Blake lets see if Santa came. BLAKE... ARE YOU AWAKE. Poor Blake had no choice. He finally woke up and they came running in our room. Mom, Dad- Can we go see if Santa came? We have a tradition where the kids crawl in bed with me while dad goes down stairs, makes sure Santa came and lights a fire. Then he calls us downstairs and we all come running down. Blakes Christmas pajama's. I can't get him to stay still long enough to get a picture. Tommy posing in his pajama's. They are really into Star Wars clone wars, and I found Star Wars pajama's. They were so excited. Tommy showing off his star wars ship. Both the kids got lots of presents and were so excited. I think the biggest hit has been the Wii and the Wii fit. I have never been a video game fan, but it makes me feel less guilty when my kids are being active while playing video games. 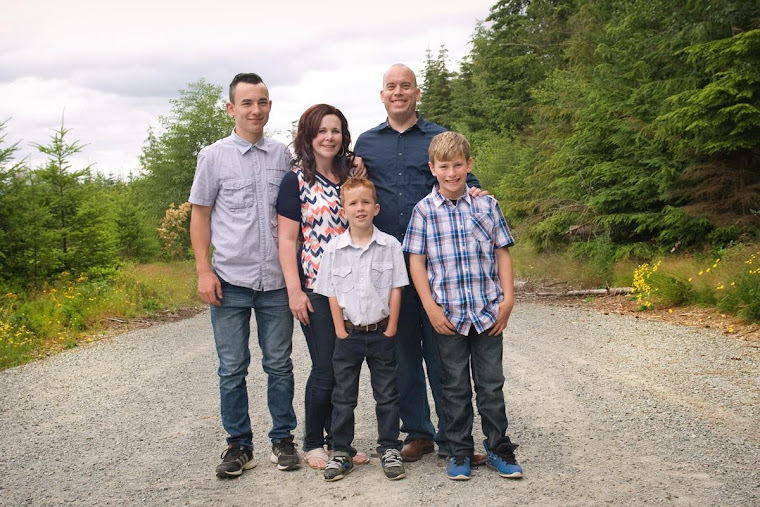 It has been a lot of fun and I find we spend a lot of fun time together as a family. Even Blake tries to play. Daddy and Blake got a gingerbread house from our neighbor and had fun putting it together. This year we had a wonderful Christmas. 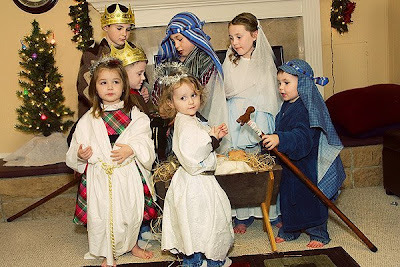 It started out with our traditional Christmas Eve at my mom's house. I love Christmas Eve. Like my sister Rebecca said it is one of my favorite holidays ever and has been since I was a little child. It has now become my kids favorite holiday as well. Christmas Eve Tommy woke up and asked when we could go to Grandma's house. We usually don't get together till around 4 or 5pm so it made for a LONG day. I think he asked what time it was every 10minutes. I can't blame him, I kept checking the time too! 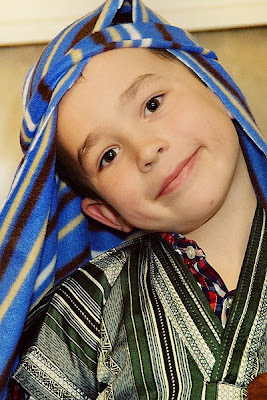 I look forward to getting together with my family, watching the chaotic childrens nativity, eating yummy food and opening a present. It was a blast!! Here are some pictures that I stole from Rebecca's blog. Blake dressed up as a Shepard. 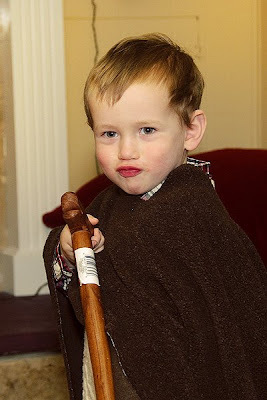 Unfortunatly the only way we could get him to agree to do it, is tell him that he was a Jedi/Shepard and he could hold a cane/lightsaber. What do you expect he is 3!! 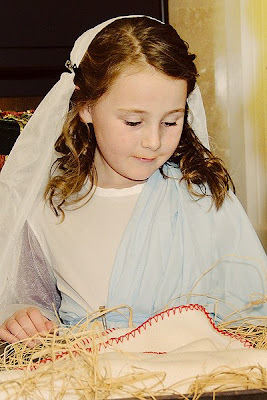 Audrey made a beautiful Mary!! And Tommy made a handsome Joseph!! 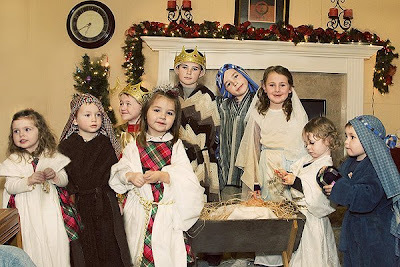 These pictures make our little nativity look so perfect. But it was actually very chaotic and funny. As I said, we had to be creative to get Blake and some of the others to dress up. Jenna wanted to be a princess so she was an angel princess. 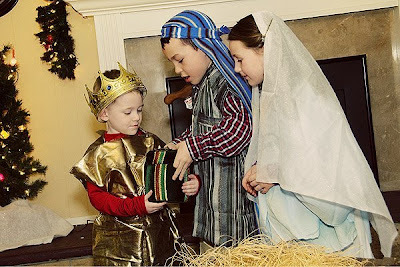 When Tommy (Joseph) and Audrey (Mary) walked in they brought baby Jesus with them. 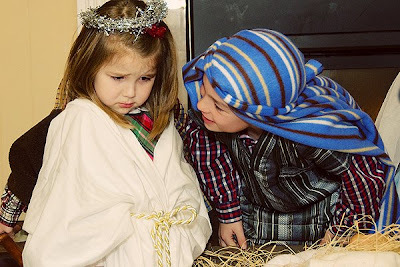 We had to remind them that baby Jesus came later. Blake kept fighting bad guys off with with his cane. Half way through the play we lost our two of our angels. Catie walked off and decided to play with the toys and we couldn't find Emily anywhere. We ended up finding her upstairs eating all the food. I guess these angels got bored and hungry. My dad video taped it and we plan on watching these videos through the years. IT will be fun to show them to the kids when they are teenagers. Brody is so cute and growing so much. It seems like everyday I look for my camera so I can take another picture of him. Thought I would share some of them with you. It has been so fun to see the snow falling. Yesterday was amazing, it just kept falling and falling. Eric would go out and shovel the driveway and sidewalks and an hour later he would need to do it again. Eric measured how much snow we had this morning off our hot tub and it showed 10 inches!! The kids have had a blast in the snow. Eric even made Tommy a snow cave which has been a big hit. Snowball fights, sledding with the dog, snowman and snowcaves, these will be memories that last a lifetime. Here are some pics of our house covered in snow. Or should I say, SOY MILK? Friday night we had a little scare with little Brody when he started throwing up blood. Since it was in the middle of the night, I called the on call Dr.on call and they suggested I bring Brody in to the ER!! I hate Emergency Room's with a passion. Since my Dr.'s office opened at 9am on Saturday I decided to wait and bring him in then. Even though he was throwing up blood, he wasn't screaming so I didn't have an extremly paniced feeling. When I brought him in to the Dr., and after discussing everything that Brody has been going through, my Dr. thinks that Brody has an extreme case of acid reflex due to a possible Milk allergy. As my mom can testify, milk has always been a problem for our family. Whether it just caused collic or an allergy. After two weeks, Brody started displaying collic like feelings, so I cut milk and cheese out of my diet. Not completly , but quite a bit. I noticed a little difference but not 100%. Friday Eric made me a soft Taco and forgot and put cheese in it. I didn't notice until I was practically done. My Dr. finds it very interesting that this is the same night Brody started throwing up Blood. That is common in a milk allergy. Soo... for me to continue to nurse If we find out for sure it is a milk allergy I will have to cut milk and anything with milk in it out of my diet. I guess that is one way to loose the baby chub from my pregnancy. I really hope it is not a milk allergy, not for me, but for Brody, it is really hard as I have experienced with Blake. But I guess in the grand scheme of things, it could be worse!! After pulling the kids down the hill a couple of times, Eric got creative..... and this is what he came up with. The kids loved it. Diogo pulled Blake and Tommy and the neighbors up and down the hill several times. It was so much fun. Even Diogo seemed to be having fun. He loved all the attention!! I didn't get the best video, my friend got a better one on her camera. I will post that one as soon as she e-mails it. Blake had a play date at some of his best friends house last week. 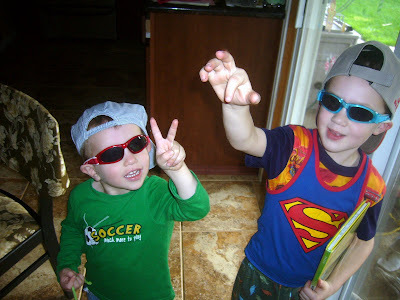 My friend captured this cute picture of Blake and Bridger, dressing up like cool dudes. I thought it was such a cute picture. Camping at Bonnie and Ricks House... Who says you can't go camping in December!! I hate this picture of me, but love it to show you how cool there property is. Look at the view. They can just walk right down to the water. How fun!! Maria and Blake- Roasting marshmallows!! Yes that is right, we were roasting marshmallows. When I told you that it was like camping.. I meant it. Blake looking for a good stick to make a fishing pole out of. Camping is not camping without fishing. Eric and Rick making the perfect campfire. Thanks Rick and Bonnie for having us over. We had a lot of fun and my boys are already talking about when we can go back again. It's Snowed Mom.... Look outside... It snowed!! It's Snowed Mom.... Look outside... It snowed! !This is what Eric and I heard at 7:00am this morning. Tommy woke up this morning and casually looked at his window and saw snow. He got so excited and woke Blake up. When they realized it snowed last night they jumped out of bed as fast as they could and ran into our room. It was cute listening to how excited they were. I remember feeling the same way when I was a kid. Who am I kidding, I am the same way. Everytime Brody woke me up to nurse him , the first thing I did was look at the snow and see how much there was. I couldn't wait for the kids to wake up so we-- I mean they could go out and play in it. We just came in to have warm pancakes, bacon and hot chocolate so I thought I would post a few pictures. This is all the fun they had all before 10am! They had a lot of fun throwing snowballs at dad, making snow angels, and sledding down our hill. Who knew an inch and a half of snow could make a little kids day! !